Although many are aware of the Buddha or the deities of Hinduism, few know anything about Mahavir (599-527 BCE), whose birth the Jain community around the world celebrates on [and around] April 16. This celebration is known as Mahavir Jayanti. 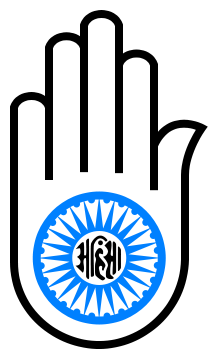 Jainism, along with Hinduism and Buddhism, are the three primary spiritual traditions of India, and archeological evidence indicates that although Mahavir was a contemporary of the Buddha, Jainism predated Mahavir by hundreds of years and, therefore, is the oldest religion in India. Mahavir is considered to be the last in a line of what the Jains call “Tirthankaras,” which literally means “maker of a ford” and refers to a human being who achieves omniscience and then teaches the path to liberation to others, thereby establishing a ford across the river of rebirth. A Tirthankara is also referred to as a “Jina,” which means “spiritual victor,” or as an “Arihant,” which means “destroyer of enemies.” A Jina or Arihant is a victor or destroyer in that he or she has conquered inner emotions and passions, and has complete equanimity that is characterized by an absence of attachment and aversion. Mahavir was a social revolutionary. He rejected the caste system and the sexism that pervaded the society of his time (and that unfortunately persists), and promoted a radical social justice movement based on complete equality and equal inherent value. He did not limit this revolution to humans and was the first historical figure to regard all nonhuman animals as full members of the moral community. He was also the first historical figure to articulate the view that the planet itself, including air, water, and earth, consists of living systems. Mahavir was, indeed, the first ecologist. The notion of revolution is often connected with violence, particularly in modern times. The central feature of Mahävir’s revolution, however, was Ahimsa, or nonviolence. Mahavir provided the most expansive concept of Ahimsa that the world has ever known not only by extending this notion to include all living beings, but by making clear that violence was not simply a matter of what we did, but what we thought and said. These two principles cannot be understood except as aspects of Ahimsa. The doctrine of Anekäntaväda serves to promote social harmony and to reduce the violence that results from absolutist views of truth. The doctrine of Aparigraha recognizes that attachment to wealth and the accumulation of material things makes us more inclined to act in violent and destructive ways. This is the only moral or spiritual principle that we need to know. If we live by this principle, we will be at peace with ourselves and the world will be at peace. Whatever our religious tradition may be, let us celebrate Mahavir Jayanti 2011 by recommitting ourselves to a simple but profound idea that all may embrace: Ahimsa.